We’ve all been there, browsing online and BAM! Unexpectedly you come across an ugly, generic 404 page error. You start to question yourself; Did I type in the wrong spelling, did I click on something I wasn’t suppose to….maybe the company doesn’t offer that product or service anymore. One thing is for certain. You’re confused. Do you click back or just close the browser tab and start a new Google search? Well there’s good news! Your website doesn’t have to be one of the many sites with a horrible 404 error page. 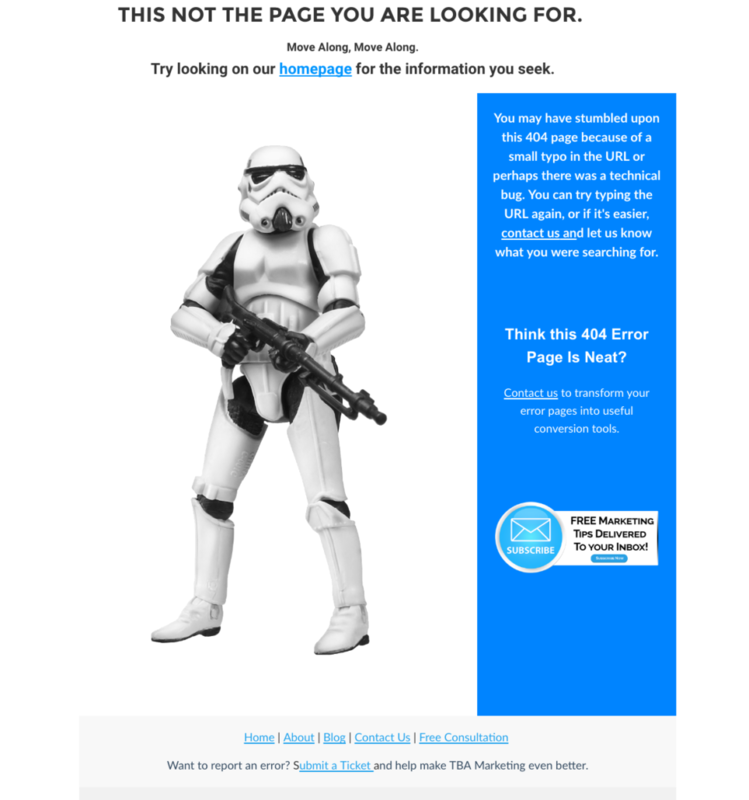 Welcome the custom 404 page that is designed to, listen to this….get your more leads! It almost sounds a little ridiculous. How can a broken, error page possibly make a potential client want to buy something from me? Check this out: www.TBA.marketing/404. I know, we’re not really asking you for a sale per-se however, there are multiple places on the page that help a lost visitor contact us in case they were searching for something specific and want more information. They can also go back to the homepage to find what they are looking for, report the broken link without even leaving the page (so that we are able to remedy the situation before someone else stumbles along the page) and if they were interested in working with us there is even a link to request a complimentary consultation. Why basic 404 Pages are bad. If you do not recall ever coming across a 404 page, let me explain their significance. You can encounter one for a number of reasons; occasionally people type in the wrong URL, or possibly there was a small amount of ‘down time’ on your hosting server. The sad part is, most people who find a 404 error page on your website will leave and never come back. Luckily, you can now turn those frowns upside down and possibly grow your leads too. Here are 3 reasons why a custom 404 page is more likely to gain you a new lead versus the ugly error page your site is using now. A custom page helps lost visitors solve a problem. Generic 404 pages don’t explain why people wound up there, so adding a brief explanation as to what happened can help guide them on what to do next. Maybe they will realize they typed in the wrong URL. Or if the page never existed because you don’t offer such a service or product. Ex. www.YourWebsite.com/WoodenShoes. A helpful 404 page will encourage them to contact you for an explanation. You can offer them something of value to download. This way, you can build your mailing list where normally you would have lost the visitor all-together. If visitors can’t find what they’re looking for on your website, at least they can still get something of value. You could offer them anything your customers usually find helpful, like an e-book, free analysis / report, or video. You want to make your visitor as happy as possible before they leave your website, since lost visitors typically don’t come back. Your business’s personality radiates through and talks to the visitor in plain language. People can be frustrated or confused when they get to a 404 page. When a visitor doesn’t find what they are were looking for and gets a typical 404 page the generic wording gives off an unfriendly appearance. A custom 404 page can ease their annoyance and entice them to stay on your website or make contact with you for further assistance. The best part about about a custom 404 page is just that, it’s customizable for your business. Use your own text, logo, photos, add downloadable file, search bar, contact us link or all of the above. So make the most out of lost wanderers on your website and convert them into leads! If this article sparked your interest in your own custom 404 page, we can help! Like this article? Use our social media links for easy sharing! To sign up on our mailing list and get free marketing tips delivered to your email, just click below.